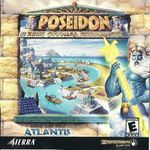 "Poseidon is a city builder scenario game. The player starts off by creating a road with homes, then focusing on the basic needs food, water, and maintenance for buildings. As the player advances into the game they require more resources and difference buildings to enhance the homes and increase the population. Players will created their own economy and trade with other cities, creating alliances and defeating enemies are common goals. Source: Wikipedia, "Poseidon:_Master_of_Atlantis," available under the CC-BY-SA License.